Chances are, that most folks reading this are waking up to some awfully darn chilly weather. So, we’ll do our part to help spread the warmth from our tropical island life. 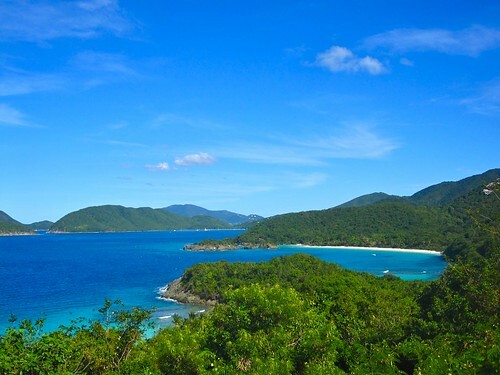 Trunk Bay - St. JohnTrunk Bay – St. John’s most famous beach – as seen from the Peace Hill hiking trail. Rated as one of the top in the world by a few sources. We’ve not snorkeled there yet, as it’s always crowded with tourists, and it’s said that the reefs there are pretty damaged. We’ll get there one day.. we’re enjoying the more remote beaches for now.